The qualified support for assisted dying in Canadian polls | Jenkins Research Inc. There has been a fairly large pool of questions on the assisted suicide issue and while it is fair to say that the public is onside in general with permitting it, this support should not be overstated. The historical trend data for assisted suicide/ euthanasia/ assisted dying relies on a series of questions that have a dichotomous structure — that is people can either be on side or the other. While across a long period of time, this approach is able to tease out some broad historical trends (particularly before 1990), it is a limited approach for capturing the state of public opinion when it comes to the current policy debates on this issue because a broad question can tell us only so much. 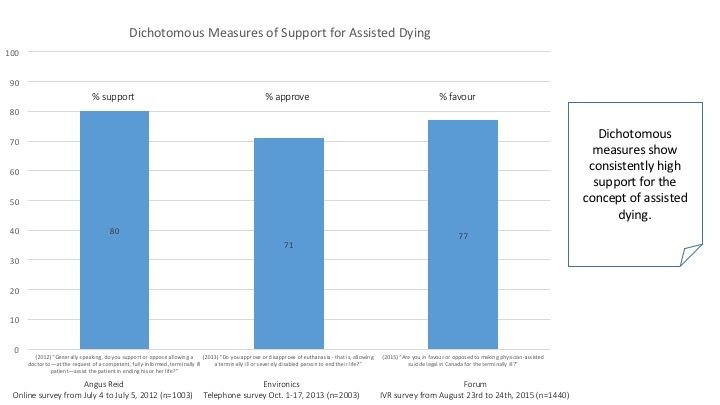 In fact, dichotomous questions overstate the support for assisted dying. Consider the figure below which shows three versions of the dichotomous approach to measuring support for assisted dying. The surveys use different research modes, question wordings, and scale options so for these questions it is not possible to measure change over time. On all three questions a majority takes the position that would suggest a willingness to allow assisted dying. “Canadians clearly from a values-based approach are generally supportive of allowing assisted dying consistent with the Supreme Court decision but this overstates the true public commitment on this issue”. Fortunately, there are several surveys that measure the broad question of policy support using 4 or more point scales. These scales capture both direction and intensity of opinion. Those with qualified support may be acknowledging that there are other considerations and/ or other values at play. Figure 2 below shows the distribution of the support side of the scale for 4 versions of the question asked in the last few years. Only 29% take the strongly support position in the Environics telephone survey for LifeCanada in 2013 but a majority is on the positive side. The telephone nature of the survey may have suppressed support (social desirability bias) and/or the priming of the current legal status may have influenced respondents. Similarly, only 37% take the most supportive position in the Angus Reid Institute poll in 2014 to a question that was straightforward and unqualified. The strongly support category gets 51% in a later 2016 Ipsos survey for Dying with Dignity, but this question clearly contextualizes the issue. Respondents are primed with the Supreme Court position and explicitly given the reason for the assisted dying request. A brief look at questions with more scale points continues to show broad support for the Supreme Court position on the issue but many take a cautious position. 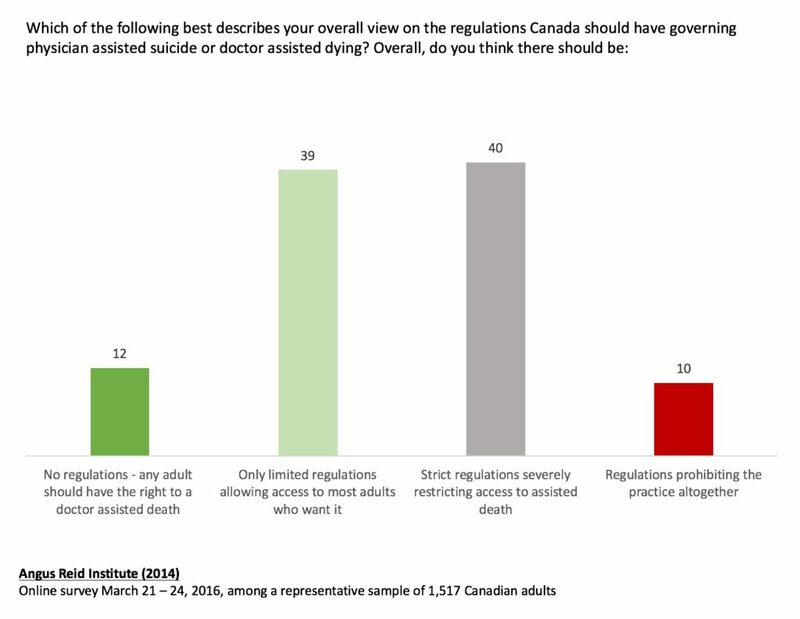 Based on these results, one could comfortably posit that somewhere between 30 and 40% of Canadians would take a very permissive view toward allowing access to assisted dying. The 2014 Angus Reid Institute survey also included a question that gave respondents more context into what somewhat support might look like. This question highlights that relatively few Canadians are occupied at either extreme on the issue (12% support no regulation and 10% want a complete prohibition). The rest of Canadians are divided; 39% want limited regulation so that access is provided to most adults who want it and 40% want strict regulation that would severely limit access. By framing the question in terms of the degree of restrictions, one could, however, say that 90% are in favour of some form of assisted dying. It is a question of spin. Large majorities (e.g. 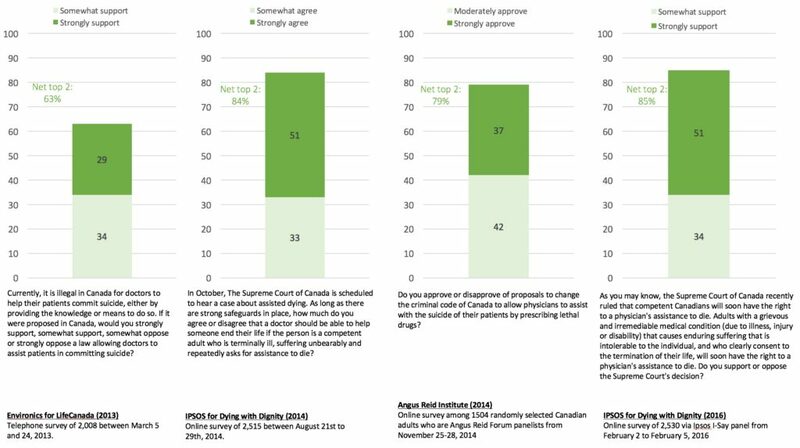 more than 7 in 10) of Canadians express support for allowing assisted dying whether asked with simple dichotomous scales or with scales that allow the intensity of support to emerge. If it is majority rule, then all of the differences around question wordings and timing are all irrelevant because the majority is in favour. Some of that support is quite soft, reflecting support, perhaps for the individual liberty aspect of assisted dying and/ or the view that it would only apply in certain limited circumstances. When we move from general support/ approval to try to give people a context in which to answer their degree of commitment to assisted dying or their permissiveness around it, the decisive majority disappears or is even more evident depending on the political story you want to tell. The size of the soft middle that includes somewhat support and somewhat oppose helps account for the fact that when polling firms press people on other specific policy options (e.g. minors, those with psychological illnesses), the overall level of support can change quite dramatically. There is a risk in the interpretation of polling data such as this that we read these as policy prescriptions instead of value-based priorities. The soft-middle is open to many alternatives and selling a political choice requires communications that will effectively address the competing values/ emotions at stake when we move from the broad question to the specific legislative response. The analysis provide here is provided to further our collective understanding of issues around public opinion and public policy. Data referred to here was originally collected by others and put into the public domain. For a list of relevant polls on the issue see these links.